For many people, facial scarring, stretch marks, blotchy skin tone or other blemishes decrease self-confidence and cause anxiety. It’s no wonder that so many yearn for a solution. Yet surgery is expensive and often involves an extended healing time, while many less costly treatments aren’t very effective. Microneedling using PRP offers you an answer to skin blemishes and signs of aging that is non-invasive, convenient and efficacious. Microneedling is a professional aesthetic medical procedure offered by Accent Aesthetics in Gainesville, FL that uses extremely tiny needles to stimulate elastin and collagen production in the skin. These two proteins are major components of healthy, youthful-appearing skin. Collagen and elastin can help to eliminate wrinkles and lines and give your face a fuller, less sallow look. PRP is platelet rich plasma, a substance with multiple medical uses. When utilized in conjunction with microneedling, PRP enhances the process for even better results, such as reduced puffiness and darkness around your eyes and creating a healthy glow to your skin. A small amount of your own blood is used to generate the PRP under sterile conditions, so there’s no risk of infection. The PRP is applied to your skin both before and after the microneedling so that the growth factors and nutrients in the PRP have the maximum effect. Which conditions can microneedling improve? Microneedling with PRP can help a huge variety of conditions including sun damage, uneven skin tones, pockmarks and acne scarring, dull skin, large pores, broken capillaries and stretch marks. It can also be employed in many body areas, including your face, upper chest, abdomen, neck, legs, back, arms and hands. What are the unique benefits of microneedling? The treatment is superior to several other procedures in that it will work on any skin tone, including darker complexions. Additionally, microneedling with PRP is much gentler than laser ablation and many chemical peels, making it a great choice if you have sensitive skin. Moreover, the treatment is considerably safer and less painful than both laser ablation and invasive surgery. A numbing cream is applied before the procedure to lessen any discomfort. Most patients report only a slightly rough sensation with no true pain. 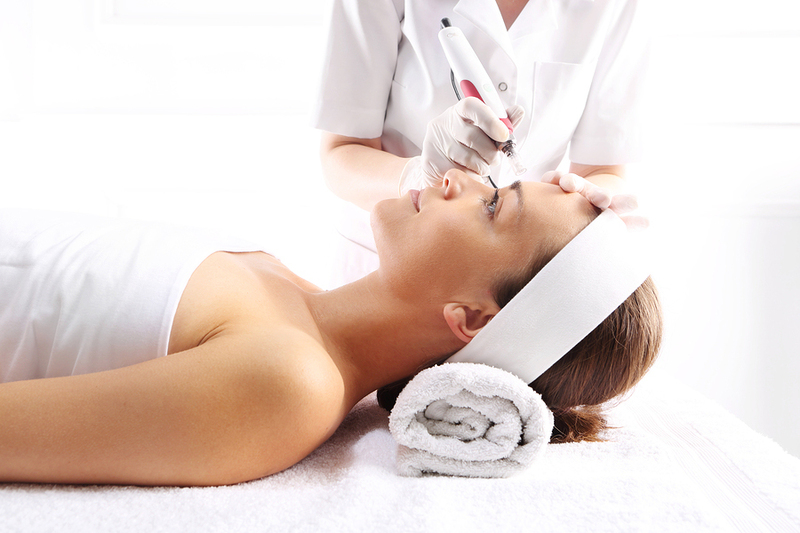 Your skin in the treated area may be sensitive for a few days following the procedure. How long does microneedling last? How often will I need to do it? The total procedure lasts about one hour. You’ll most likely notice a healthy glow to your skin immediately after treatment, and the results will only improve over the next few weeks to six months. For the best results, you should receive at least three treatments at four to six week intervals. After that, annual treatments are sufficient for most patients. PreviousPrevious post:Celebrate New You in 2017!NextNext post:Happy Valentine’s Day Specials!